What are the Foods of Greek Orthodox Lent? Several years ago, I spent the night before «Clean Monday», as Greeks call the first day of Lent, baking the traditional Lenten flatbread lagana with a local Athenian baker. Even though he went about his business methodically and professionally, turning out more than a thousand or so loaves, he didn’t fail to observe all the traditions of the fast. 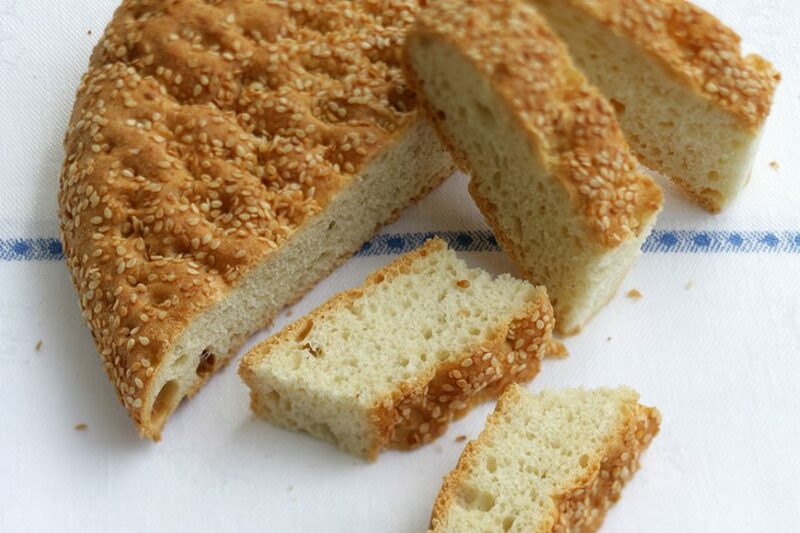 Indeed, he was a part of those traditions, for lagana, which traces its roots to the flat grilled batter breads of the ancient Greeks, is the lenten bread par excellence. Byzantine hymns wailed softly in the background as his assistant cut off quarter-kilo rounds of dough. The baker took each piece, slapped it onto his floured work table and proceeded to roll it into perfect ovals with a special studded rolling pin. Every half hour or so he walked over to a counter at the back of the bakery where he had his evening meal laid out: a container with taramosalata, the Greek fish roe spread, which he ate with fresh tender stalks of young garlic; small pickled green peppers; a small plate of mixed pickled vegetables and olives; a few pieces of rice-stuffed squid and some octopus preserved in vinegar brine. A wedge of halva lay on its side, waiting for the baker to sprinkle some lemon juice over it and wash it down with some retsina. In that small array of dishes, I realized, the whole philosophy of the Greek Lenten table was apparent. Thinking of Lent as a period of culinary significance might seem ironic–after all the Fast is meant as a period of spiritual and physical cleansing. Yet, some of the best fare in all of Greek cooking are the dishes culled from the tradition of abstention, from the 40 day period before Easter when one shuns all animal products. Until just a few decades ago, the majority of Greeks abided by the dictates of the religious calendar, fasting not only before Easter but before many other major holidays, so that they actually kept off meat and dairy products for nearly half the year. As a result, a whole culinary repertory evolved that is a mirror of the ingenuity of home cooks who relied on the bounty of the season to provide filling, nutritious meals. There are several standard preparations, but the foods of the Greek Lenten table really comprise a wealth of vegetable, grain, and seafood dishes. Fish traditionally is not allowed, but all manner of shellfish are. Octopus, squid, and cuttlefish are favorites, and there is a wealth of regional preparations for each. Among them are deliciously aromatic octopus stews, seasoned with cinnamon, orange rind, allspice and tomatoes; squid or cuttlefish pilaf or risotto; octopus cooked with short pasta; fried mussels; and much more. Stovetop specialties abound. Indeed, one of the greatest legacies of the Lenten table is the array of lathera—basically one-pot casseroles made with vegetables and pulses, which rely heavily on the use of olive oil (lathi is the Greek word for oil). These include preparations such as chickpeas stewed with onions, garlic and olive oil, lentil and other bean soups, white bean and giant bean casseroles, perfumed with herbs, tomatoes, and oftentimes greens. Another classic, and one that falls into the category of lathera, is spanakorizo, a stovetop medley of spinach and rice in which olive oil and lemon juice are drizzled in without restraint. Halva is by far the most popular Lenten sweet, and in Greece it comes in many versions. The store-bought variety is made with tahini (sesame paste) and sometimes studded with nuts and raisins, or marbled with chocolate (a slight but tasty aberration). It is sold in blocks or made in large pans. 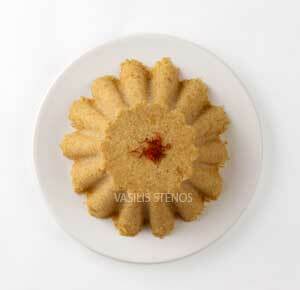 This halva is made with semolina and flavored with saffron and honey syrup. Another commercially made halva is a regional specialty of Thessaly. Called halva Farsalon, it is made with cornstarch or rice flour and has a chewy, gelatinous texture and an opaque amber color. It is usually has a delicious crust of caramelized sugar on top. Home cooks prepare halva, too, with semolina flour, olive oil, water, and sugar syrup. The result is more like a grainy pudding. Sometimes nuts and raisins are added to the mixture, and sometimes cinnamon is sprinkled on top. This type of halva is called Halva tis Rinas. Any sweet from which butter, eggs and dairy products are missing is allowed during lent. Another traditional category are the small pastries, commonly called skaltsounia and filled with nuts and dried fruits, which are found throughout Greece. 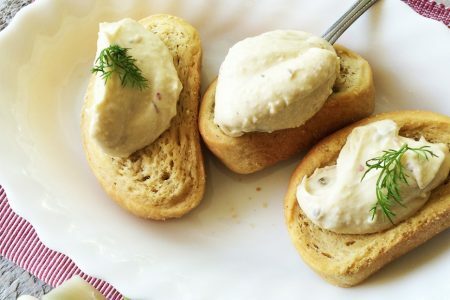 Tahini also plays a role in Lenten sweets beyond halva. 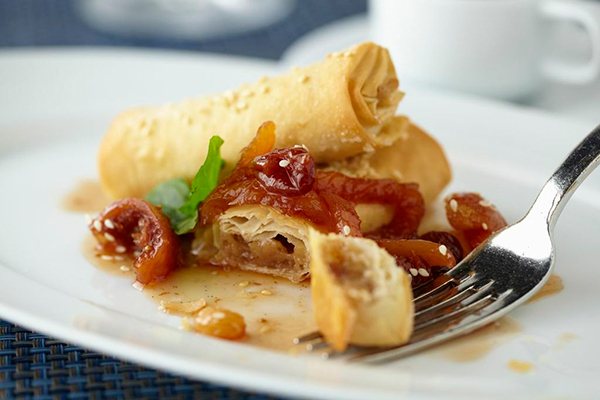 One of my personal favorites during Lent are the tahini-filled phyllo flutes and sweet tahini breads that are traditional in the north of Greece and Cyprus respectively.